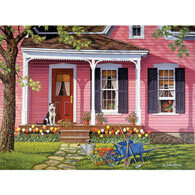 Christmas Visit is a 300 piece jigsaw puzzle designed by artist Ruane Manning. 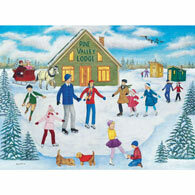 A family has just arrived by sleigh to celebrate Christmas at their parents country home. Warmth emanates from the decorated windows as snow gently falls throughout the scene. Available in two piece counts.